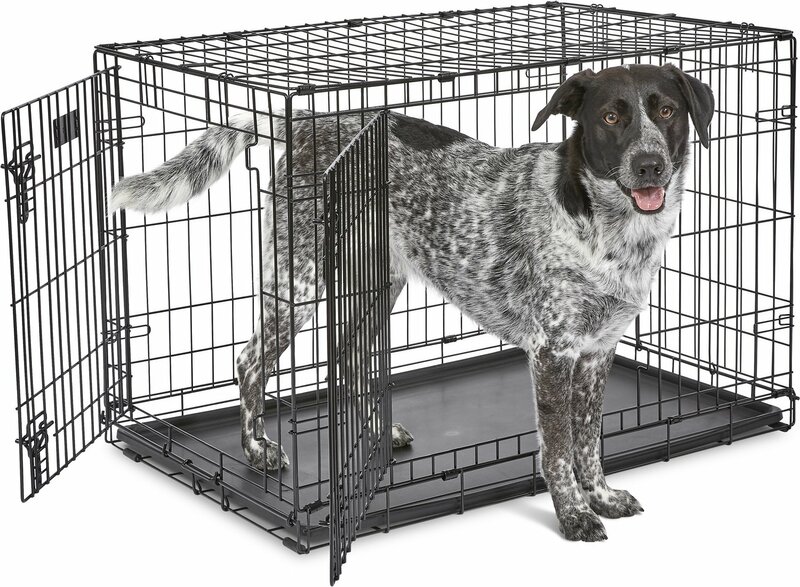 The Midwest iCrate Double Door Fold & Carry Dog Crate is designed completely around the safety, security and comfort of your Dog. This dog crate sets up easily with the fold and carry configuration that requires no use of tools for every pet parent's convenience. The dog crate comes to you equipped with every feature you can think of; two doors for easy access to your pet inside either thru the traditional front door or from the side with the second door. The double door also affords you more opportunities to fit larger crates easily in your existing rooms or vehicles, a composite plastic pan for easy cleanup in the event of an accident, two plastic carrying handles to move the dog crate from one location to another comfortably, safe and secure slide bolt latches for the safety and security of the pet inside and the furniture on the outside, and most importantly a free divider panel for use while your puppy is still growing up. Double doors give you easy access to your pet and allow you to position crate conveniently in your home. Fold and carry configuration and ABS plastic handles make it very easy to relocate or travel with. 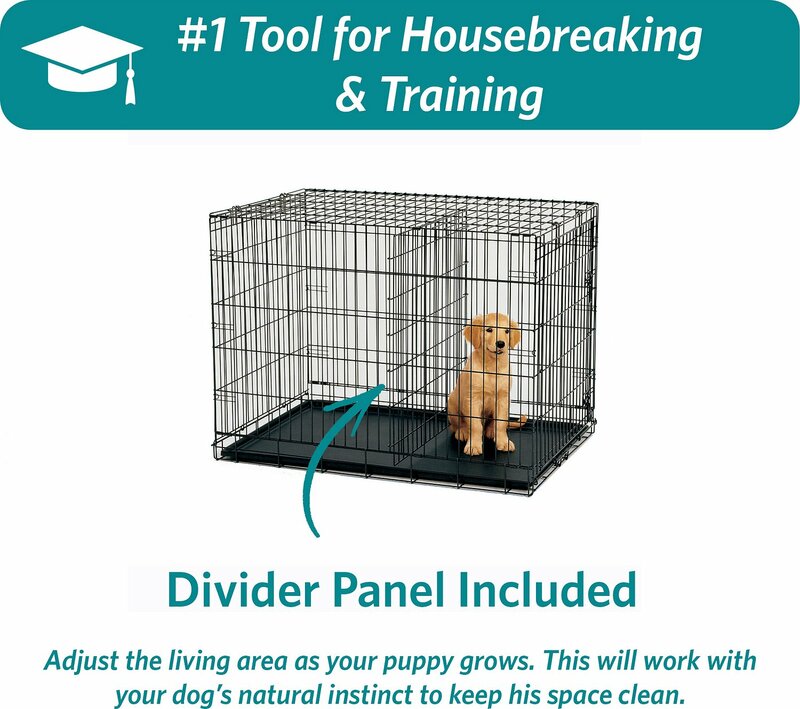 Includes a divider panel so your puppy can grow into the crate. This crate will be the only one your dog will ever need. Composite plastic pan is durable, replaceable and easily removable for cleaning. 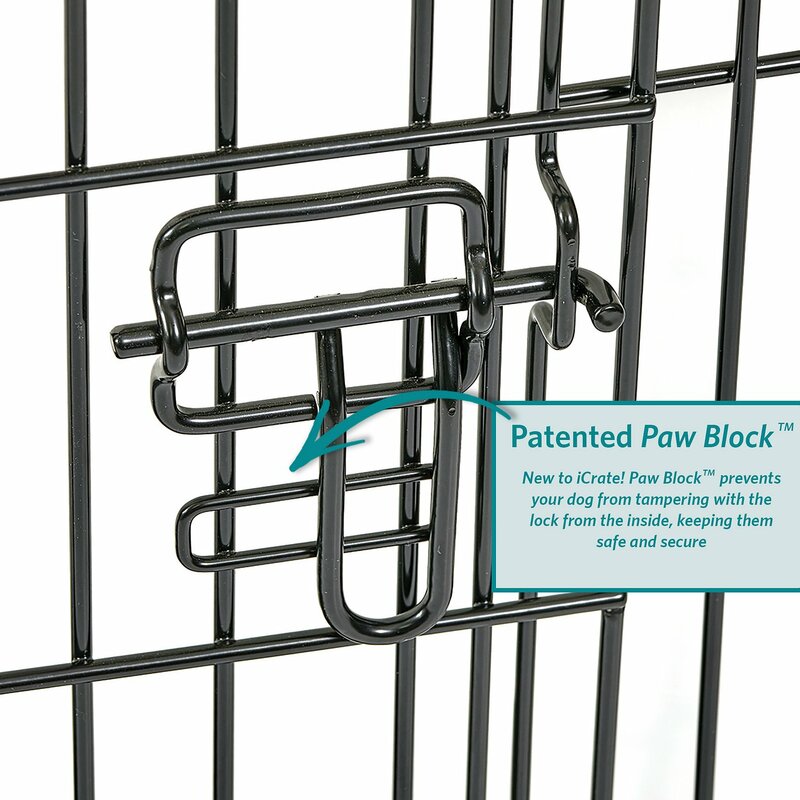 Safe and secure slide bolt latch keeps your pet secure inside the crate and rounded corners protect your pet from injury. For safety purposes, MidWest recommends removing your dog’s collar, harness or leash before placing them in their dog crate. Monitor your pet during the first few days of crate training to ensure that they are adapting well to their new home. 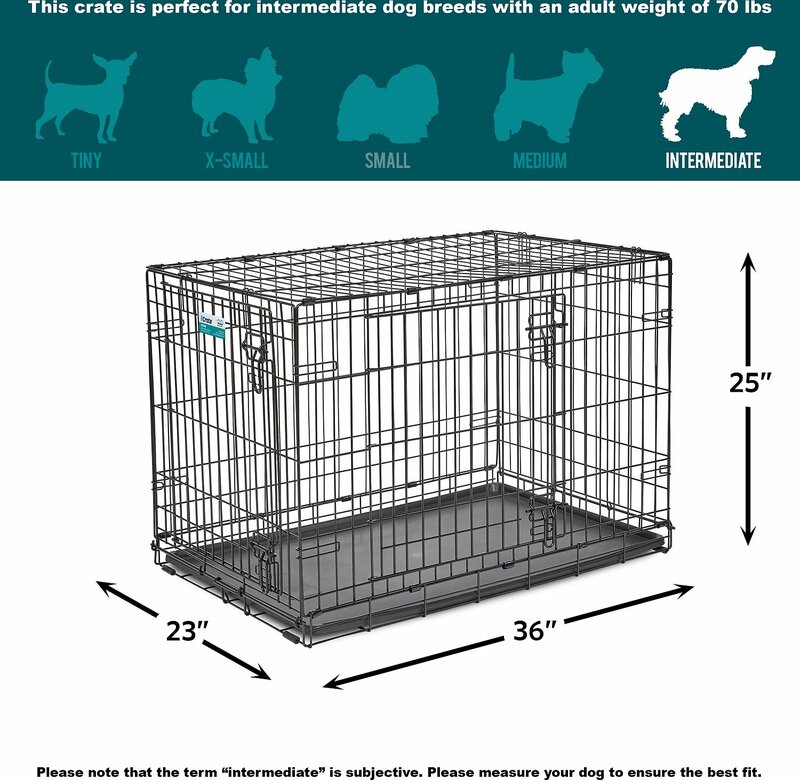 Revamp your iCrate Dog Crate with the Midwest iCrate Dog Crate Replacement Pan! Clean pen routinely with a mild, non-toxic cleaner and water. As instinctual den animals, it's important for dogs to have a comfy place to nest. Crates also help with potty training and reducing habits like chewing or barking, while providing a safe, den-like home for your fur baby. MidWest designs their crates with safety, security and comfort as their priority. No matter the age of your dog, you're sure to find the right fit for your unique pal. For a lightweight crate that requires no tools, folds flat, and still has the security of heavy-duty slide-bolt latches, look no further than the MidWest iCrate. It’s made for easygoing dogs and even comes with a divider panel so it can grow with your pup. 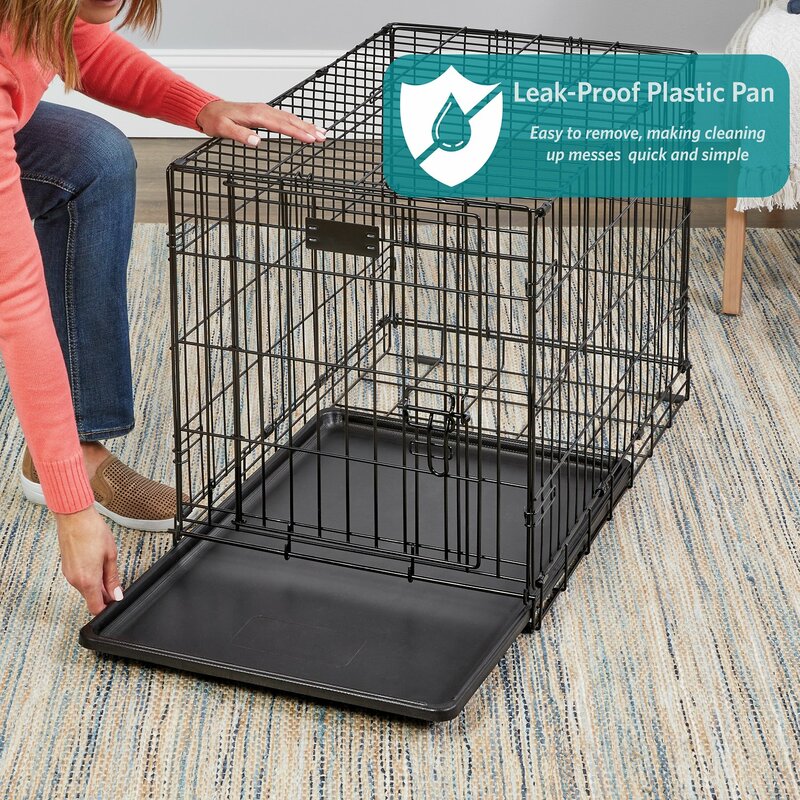 Pair that with a removable, ease-to-clean plastic pan, sturdy carrying handle, and surface protective rubber feet to create the recipe for a crate made just for your dog. 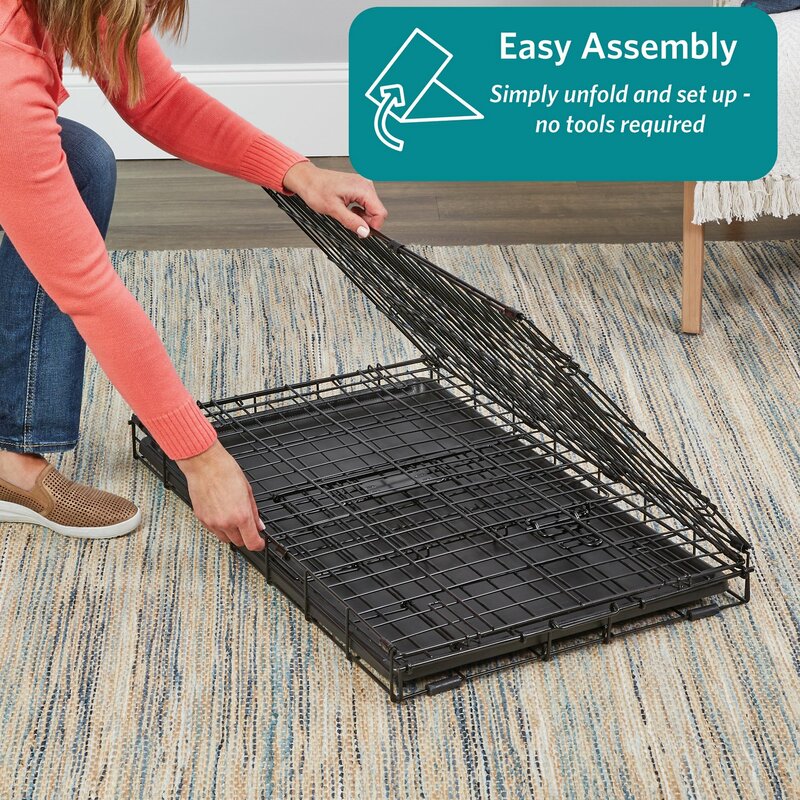 Made with heavy-gauge steel and wire mesh, MidWest's Life Stages is a sturdy cage that can offer extra security. Rubber rollers protect your floors while a sturdy carrying handle makes it easy to move before your pal gets in. 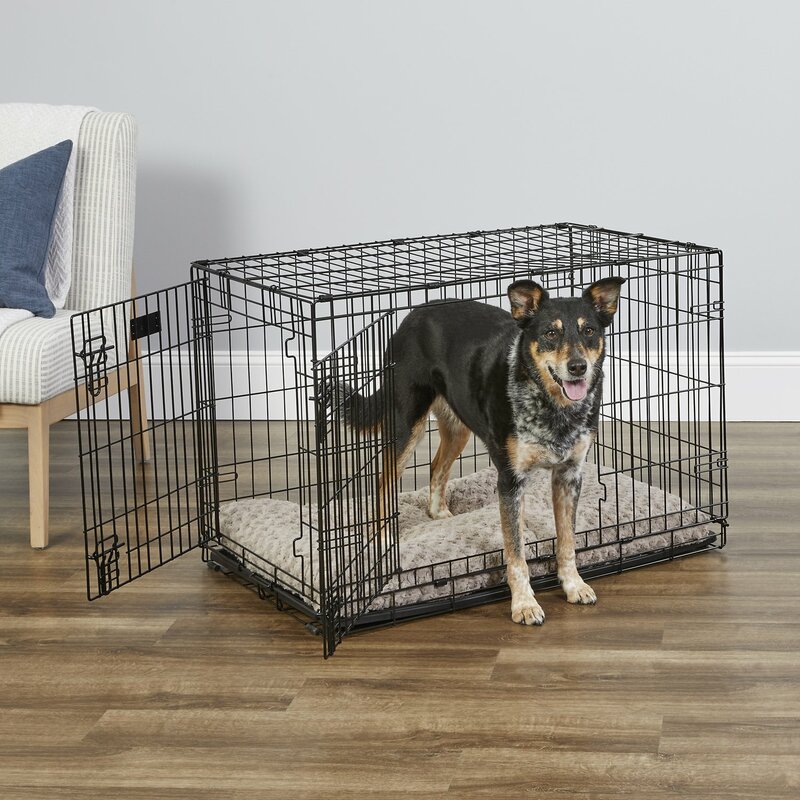 With rounded corners to protect your dog, slide bolt latches to keep him safely inside, and a divider panel that can be moved—and removed as your pup grows—it's a crate for all life stages. For optimal security and safety, the Ultima Pro is MidWest's most durable crate, made of professional-gauge steel designed to stand up to chewers and stronger dogs. The dual door access allows your dog to enter and exit on either side—but only when you say so! Your dog will feel safe and cozy in this retreat, made just for those pups who need a little extra safekeeping. MidWest, a division of Mid-West Metal Products, makes a wide variety of products for dogs and cats. Their guiding philosophy has led to plenty of happy two-legged and four-legged customers since 1921. From crates and playpens to keep pets happily safe, to accessories like beds to keep them comfy, there is is no shortage of love poured into these products created by pet enthusiasts. I purchased the new cage for my German Shephard which is only 5 months old. I wanted to make sure she had the proper room. If your pup isn't poddy trained, use the divider. She will grow into the cage perfectly with needed room to lay down and be comfortable. This is a very nice, great quality crate. The dual door and the interior divider provides great options and customization. It was also so easy to get it ready, just remove it from the box and unfold. The bottom tray slides out for easy access and it cleans up nicely. We have two of these crates and absolutely love them. They are secure, easy to set up and break down, and easy to clean. The 42 inch is the perfect size for our 10 month, 50 pound golden. I have a 70ish pound pit lab mix and he is pretty strong and has separation anxiety and I have had this cage for him for a little more than 2 years and it’s super sturdy easy to assemble and take down and travel with if needed and has no damage and it’s just an amazing dog cage and I would 100% buy it again. Perfect. Love the cage. My dog is in love with the bigger space. It was easy to set up and love that it has tiny wheels to move it around. It's very sturdy as well. I used this crate for my 80+ lb pitbull with separation anxiety. He was a nightmare anytime we had to leave him alone longer than a few minutes. This helped us crate-train him and have some peace of mind - a real godsend. He was never able to get out or damage the cage at all, and it helped SO much when we had people over that we didn't want him interacting with. I ended up giving this crate away to someone who puppy-sat him and I got the 54-inch XXL crate by Frisco because my husband wanted more "headspace" for the dog. That ended up being overkill so if I got another cage, I would re-purchase this. Easy to put together and take down, easy to clean and SECURE. 5 stars. This is a great crate. The two doors are very useful, and the whole thing is very sturdy. I have two now, and I have packed these things up and moved with them so many times - even with the bigger size I can usually get both into my car. The only issue is that the crates are heavy - the handles fell off of both within the first year - which is not surprising given how sturdy they are. I purchased the larger size(s) for each dog because they like to sprawl, and the only time either one has had an accident in the crate was when they were sick. Overall, the dogs like the crates; the crates are strong and durable; and I would buy again.